Retail sales turnover adjusted for working days increased by 5.2% year on year in November. The latest data came in lower than the previous month, at least in terms of growth rates. Excluding the one-off peaks from the big picture, it is quite clear that the sector’s performance has been gradually worsening since the end of 2017, but the retail sector as a whole is still in good shape. The details show the usual end-of-the-year pattern in the growth structure of different types of shops. Turnover in non-food shops was on the rise once again, marking a 9.1% YoY growth, the strongest since September. 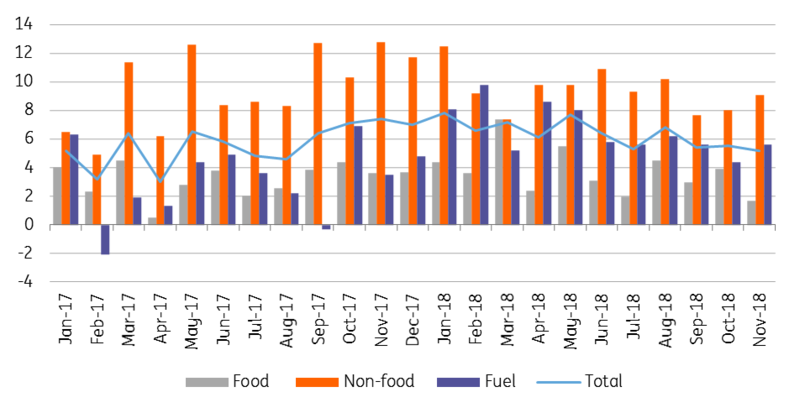 In the meantime, food shops’ performance gave us a negative surprise, posting a figure which is below the 2018 average and even the lowest since early 2017. However, we expect a correction in food shop turnover in December due to the holiday season. As far as automotive fuel sales are concerned, growth roughly fitted the 2H18 tendency affected by oil prices. 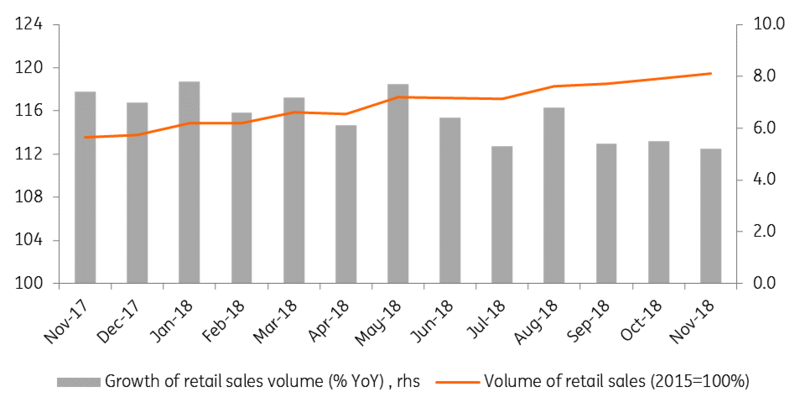 For 2018, the retail sector still paints an optimistic picture, although the general slow down in consumption is in line with the continued drop in consumer confidence indicators and the high base is also clearly visible in the monthly disclosures. Looking forward, instead of the previous 6-7% annual increases we’ve seen in 2018, we see a 4-5% growth in the retail sector in 2019.